When you've got a winning combination, why mess with anything else? That's the way we felt as we were selecting a dive operation in 1985. If you've been keeping track, you'll notice there isn't an entry for for 1984. To make a long story short, I had left my job in 1983 to go back to school for one year to pick up my teaching certification; in hindsight it wasn't worth the loss of a dive trip. But anyway, we decided to try the Windward Island chain and began by looking to see if Peter Hughes had an operation on any of the islands. We chose St. Lucia. 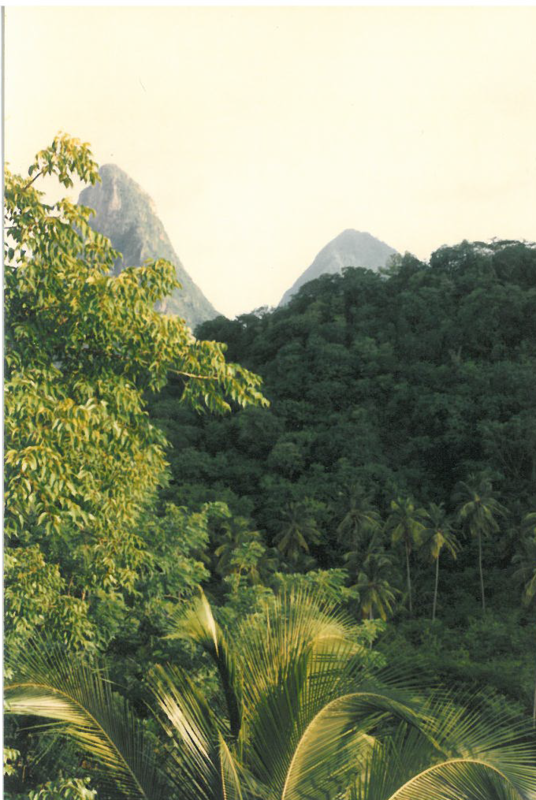 Anse Chastanet on St. Lucia was the selection we made; and a fine choice it was. For the movie buffs, you might remember a scene in Superman II where the Man of Steel flies to an island to pick an exotic flower for Lois Lane. Well, he picked it on the island of St. Lucia. 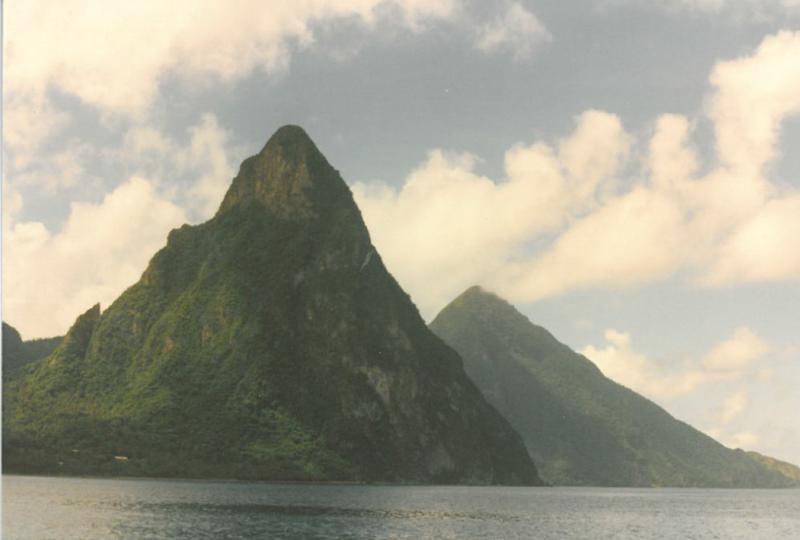 Of all the island we picked to date, St. Lucia was the stereotypical tropical island; lush rain forest, cool sea breeze, and a pair of volcanic peaks - known as the Pitahs - shrouded in clouds. We could almost hear the jungle drums. The one item that didn't fit the perfect island profile was the sand. 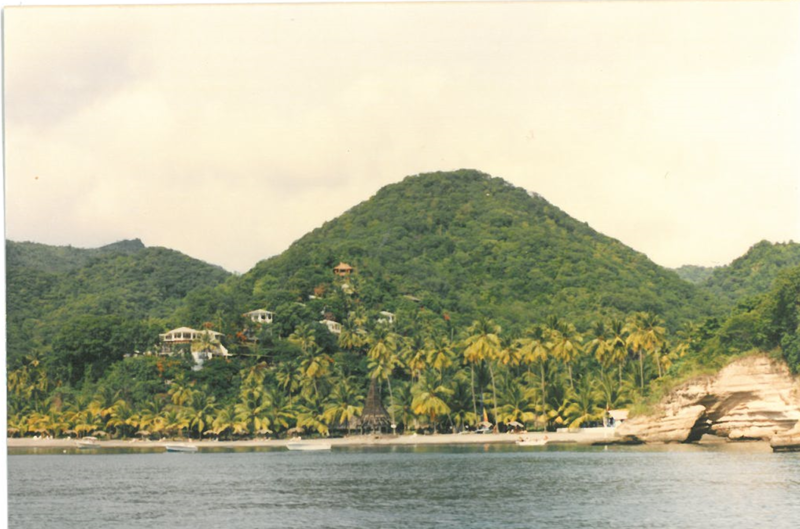 St. Lucia - being volcanic - had sand beaches that were of black sand. When we dove, the sand between the coral heads was predominately black . And the beaches...we thought of Dudley Moore in "10" where he was running across the hot sand. The airport scene has already been described from earlier trips so I won't go over that aspect again. The trip to the hotel from the airport was a bit different WE arrived at the island just as the sun was setting and climbed into the back of a Land Rover equipped to carry dive tanks. The road to the hotel was winding, jarring, and extremely narrow with many areas of shear deadfall drops. If one vehicle met another, it was quite a maneuver to get around safely. The drive was long, so we struck up a conversation with the you man who served as our cabbie. His English was quite good and we learned a lot about the education, industry, and history of the island. The French were the island's first European settlers. They signed a treaty with the native Carib Indians in 1660. England took control of the island from 1663 to 1667. In ensuing years, it was at war with France 14 times, and rule of the island changed frequently (it was seven times each ruled by the French and British). In 1814, the British took definitive control of the island. 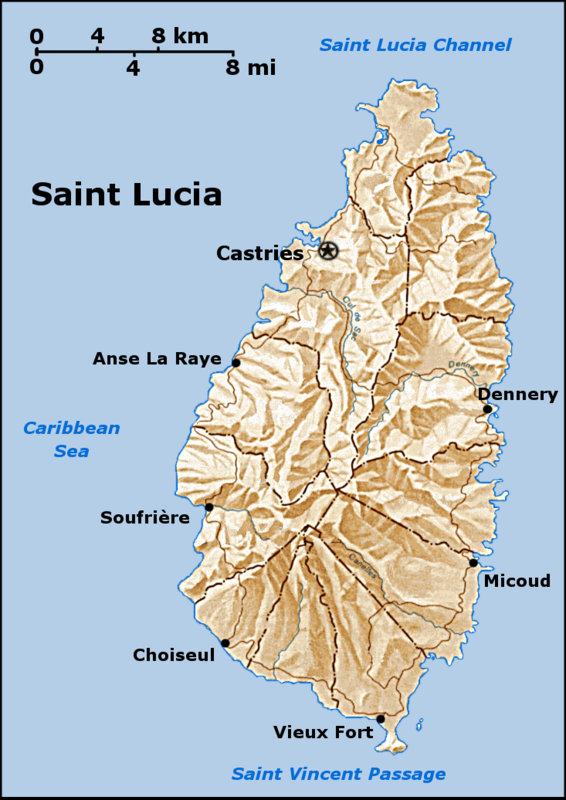 Because it switched so often between British and French control, Saint Lucia was also known as the "Helen of the West Indies". Representative government came about in 1840 (with universal suffrage from 1953). From 1958 to 1962, the island was a member of the Federation of the West Indies. 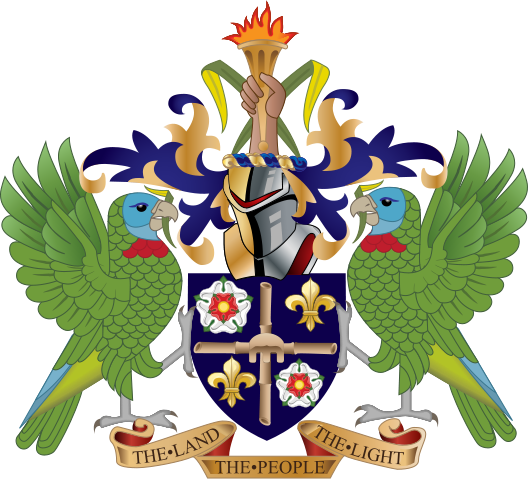 On 22 February 1979, Saint Lucia became an independent state of the Commonwealth of Nations associated with the United Kingdom. We arrived in the dark at the upper lobby of the hotel where our luggage was unloaded and we received our briefing. Anse Chastanet was a relatively new operation at the time complete with tennis courts, hiking trails, luxurious rooms, fine dining, and all the other amenities that make a hotel an attraction for divers and non-divers alike. The hotel did have one characteristic that is notable above others. To get from the rooms that were built into the mountainside overlooking the ocean down to the dive operation on the beach, you had to descend over 100 winding stone steps. Likewise, to get back to your room required a healthy climb. Needless to say, we planned our days to limit the number of trips up and down the mountain to our room. We generally ate a continental breakfast of fruits and breads, cereal, and eggs with toast each morning and gathered our regulators, masks, towels, sunscreen, and whatever else we thought we might need before trekking down to the dive shop. We averaged two dives a day; one in the morning, ate lunch at the dining area on the beach, a second dive in the afternoon, lounge around the beach or snorkeled, and back up the mountain for dinner. Upon arrival, our dive gear - with the exception of our masks and regulators which we kept - were loaded onto the shoulder of one of the staff and taken down to the dive shop each morning. Thank God! At that time, all of our dive gear - including weight belts - was wrangled into one large nylon bag that the two of us struggled to carry. Diving is not a lightweight sport. The equipment is heavy everywhere but under water. 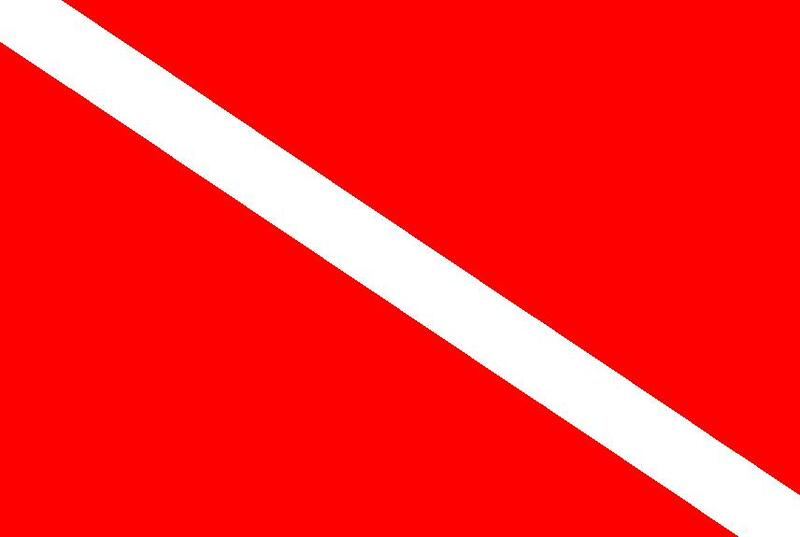 The dive operation, as I mentioned, was owned by Peter Hughes and was managed by Wayne and Karen Brown. Peter Jackson and Charles were the Dive Masters and Mark was the general muscle of the outfit, Everything was clean and the daily routine of running the dive shop ran like clockwork. We could sign up for a dive, show up at the boat, and off we would go. Our beach checkout dive was a good start to an excellent week of diving. We dove a cave where we came up into a pocket of air. The Dive Master spotted an octopus; the first of several on this trip. We swam into a large school of sergeant majors (the fish not the military) and played with several banded shrimp. The afternoon dive was to be at "Cay" at 2 PM. We entered the rolling seas for fifty minutes of breathtaking beauty. It was a wall dive at an average depth of 40 feet. Visibility was 100 feet or more and we saw a small moray eel, sea cucumbers, large sea biscuits, spotted drums, and arrow crabs. The current was very strong, but when we ran out of air, we just surfaced and the boat was there to pick us up. It doesn't get any better than that. Dining at the Anse Chasteenet was superb! Shrimp, shrimp, and more shrimp; in cocktails, cold salads, fried, broiled, anyway you can imagine. I've already described breakfasts with the banana quits and here a darker more aggressive finch would perch nearby looking for scraps. The birds were territorial which included specific tables. It was all quite amusing for the first few days; then it became matter-of-fact. Lunch was down at the beach in a long open hut serviced by the staff. Our selection was typically American; burger, fries, and a Coke. After trying several other selections, this was the tastiest and the least expensive. Lunch would take an hour whether you wanted it to or not. Dinner was relaxed. The dining area on the upper terrace was open and small but the food was excellent. Our waitress for the week was a lovely young woman; an English major from Toronto who was somehow related to the owners. The rum drinks were potent, the beer had a tasty bite, and the meals were always gourmet. Unfortunately, a dive log doesn't contain space for what the menu was for the day or what special events took place so I have to rely on a failing memory. On August 12, we picnicked. Our first dive was "Superman"; named for the strong currents that made you fly over the reef. Fortunately for us, the conditions were not bad that day. We saw immense spiny lobsters and huge tube worms. Regardless of the current, it was still a drift dive and the boat picked ups up in a cove in front of an old copra plantation. The owner at the time was a former fling of Princess Margaret and the plantation was a menagerie of animals from goats and chickens to burros...and an elephant named Bupa. Bupa was just a baby then, but it had learned to come running to the beach for bananas fed to it by the divers. It looked out of place cooling its packaderm toes in the ocean. Lunch was a bar-b-q with the typical American fixings. We had a few hours to relax before our second dive at "Turtle Reef"; which was straight out from the beach. We were ferried out in the boat and swam our way back towards the beach. Along the way we saw sand dollars and sea biscuits, scallops, and sea cucumbers (sounds more like a salad than a dive). That evening we made a night dive from the beach where we saw numerous lobsters, crabs, moray eels, squid, and slipper lobsters. Slipper lobsters are a family of decapod crustaceans found in all warm oceans and seas. 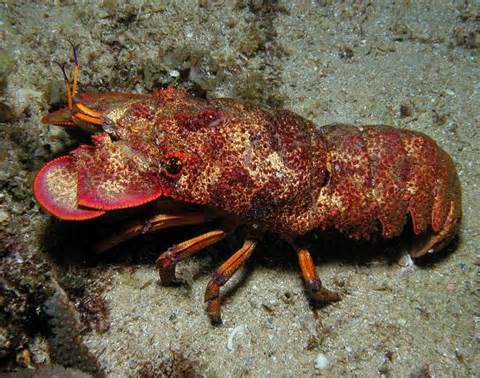 Despite their name, they are not true lobsters, but are more closely related to spiny lobsters and furry lobsters. Slipper lobsters are instantly recognizable by their enlarged antennae, which project forward from the head as wide plates. All the species are edible, and some, such as the Moreton Bay bug and the "Balmain bug" are of commercial importance. "Coral Gardens" and "Keyhole Pinnacles" were lovely reefs and lovely dives. 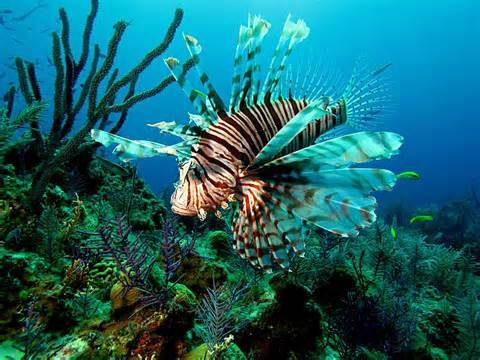 Keyhole is were I saw my first lion fish. I had gotten good at locating and avoiding stone fish, but this was the first time I had seen their more poisonous cousin. "Devil's Bowl" was an example of how a reef can be destroyed. What once must have been enormous coral heads were broken and lying in chunks on the seabed. This could have been from any one of a dozen causes, but the result was a dead reef. We had the pleasure of meeting Peter Hughes again. He had just begun manufacturing a fog-free dive mask and a new buoyancy control (BC) vest that was impressive. Dad approached Peter and asked to see the new BC. "See it...hell try it." So the next day, Dad and Peter swapped vests. Dad later purchased the vest from Peter and I have never seen the product line again. Dad should have had it autographed. We saw more octopi in St. Lucia than anywhere else. A soft, silky, rubbery animal, the octopus is highly intelligent. If you place a crayfish in a bottle and cork it, the octopus will figure out a way to take the cork out to get to its prey. On one occasion we got to see how aggressive the animal can be. A tap on a tank caused us to turn our heads towards the Dive Master (that was the universal heads-up signal) who had spotted an octopus on an empty Crisco bottle. When the Dive Master tried to take the bottle away, the octopus put up a struggle. Their grace and motion in the water is amazing. We made a second trip to see Bupa on a rainy day. Fortunately, rain doesn't delay diving. After all, you are going to get wet anyway. It doesn't do much for the lighting, but it does create a different effect looking up as the rain dimples the surface. Our last two dives were "Fairy Land" and "Anse La Ray"; named for the town by the same name. We bought our fair share of T-shirts and trinkets for Mom and that night began the heartbreaking process of packing to go home. After a week in saltwater, our dive bags and gear smelled as though something had wanted to sneak into the U.S. and died along the way. The days following the trip were consumed in getting the stink our of our clothes and gear, explaining what photos were supposed to be, and beginning the process of selecting the next dive trip. We were four shades darker, four pounds heavier, and decades of experience wealthier.